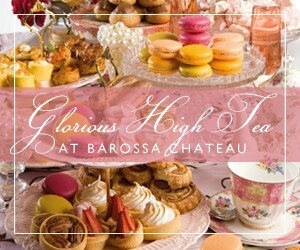 Barossa Chateau specialises in creating a personalised high tea for your celebration. Enjoy this English tradition surrounded by exquisite antiques and charming artwork, in the understated elegance and warm ambiance of the Chateau. Surrounded by 30,000 roses this world renowned garden was opened by HM Queen Elizabeth ll, what could be better than a splash of royalty in the perfect setting for an indulgent celebration? With a range of alluring menus to choose from our high teas are delectable, and menu options include savouries of caramelised onion tarts, petite sandwiches, Frittata, Savoury Muffins, followed by sweet treats of fluffy homemade scones, double cream, macaroons, salted caramel tart, lemon meringue and palmiers to list a few! Accompanied by unlimited freshly brewed coffee and pots of tea. Packages can include the Chateau’s own sparkling pink moscato, or sparkling pinot chardonnay, the perfect accompaniment to High Tea and your special celebration. A package can even be selected where each guest receives a gift on the day, our aim is to make everyone feel very special and leave with fond memories. Our packages include fine bone china, tiered high tea plates, colour theme to match your request, ensuring your event is a stylish affair! We have a choice of locations, from the barrel room, the art and antique gallery, or our rose garden.